Home Expert Advice Skincare Advice Acne & Breakouts Do Birth Control Pills Help Acne? If you’ve heard that birth control pills can clear up acne and wondered if that’s actually true, the answer is … quite possibly. Let’s delve into what the research has to say. After analyzing numerous studies that compared the effects of different types of oral contraceptives with one another, as well as studies that compared the effects of birth control pills with those of a placebo, the results were impressive! In fact, they unanimously showed that acne can be improved by taking birth control pills. 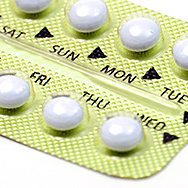 Which Type/Brand of Birth Control Pills are Best? While there are many different types of birth control pills, by and large, the consensus is that most deliver similar positive results. Some studies indicate that certain “combined oral contraceptives” net slightly better results over other types of birth control pills; however, the results aren’t significant enough to draw a line in the sand. Hence, there’s no clear recommendation that one brand or type of oral contraceptive is superior to another—you and your doctor can discuss the pros and cons of each. Does all of this mean that birth control pills will work to clear up acne for everyone who uses them? Unfortunately, no. While the research is impressive, not every participant saw an improvement in their acne. It’s also important to note that, in most cases, it takes several weeks, even months, before results appear. And, of course, every oral contraceptive has other side effects that you need to discuss with your physician before a prescription is written. Research is clear that using the right acne-fighting skincare products can reduce breakouts. The three key products you need are: a gentle cleanser, a product containing 2.5 to 5% benzoyl peroxide, and a leave-on liquid exfoliant containing 2% BHA (salicylic acid). This type of skincare routine + oral contraceptives may net even better results.